Six years ago this week, a 7-month old baby boy was abandoned at a hospital in Mbarara in western Uganda, Africa. He was malnourished and weighed just 7.6 pounds, a size typical for most newborns in America. 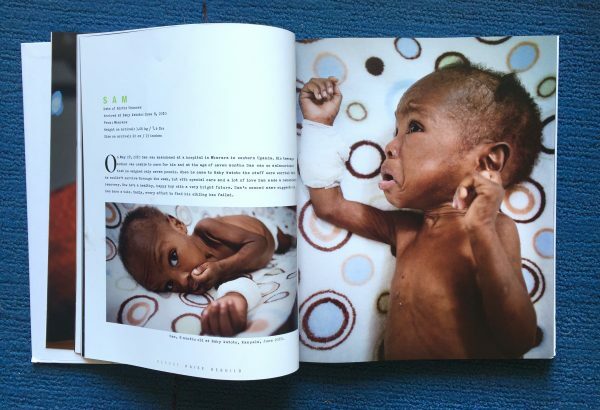 The Watoto book we bought at the concert included pictures of Sam, at 8 months old at Baby Watoto, Kampala, in June 2010. Photo courtesy of Watoto Child Care Ministries. His then teenage mother was unable to care for him and he was brought to a place called Baby Watoto, where workers feared that he would not survive the week. But with special care and love, the boy would survive. I know this to be true because he slept in our guest room last night and smiled all through breakfast at our table this morning. Ronald, Ann, Sam, and Steve outside our home in Nebraska. Today, Sam is a bright-eyed, exceptionally well-mannered, 6-year-old who is full of life and a love for Jesus Christ. We had the pleasure of hosting Sam in our home this week, along with 9-year-old, Ronald, and their adult caregivers, Ivan and LaTicia. 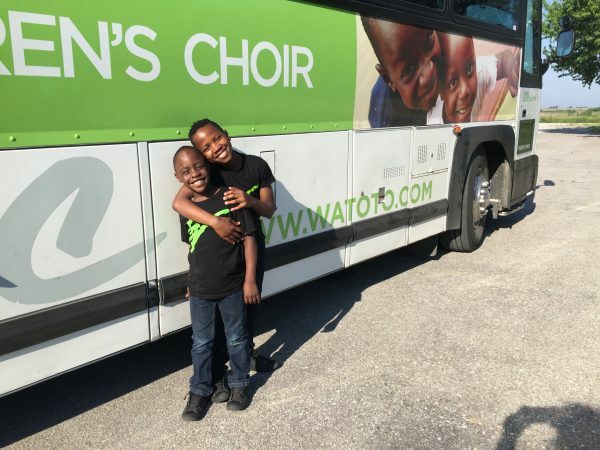 They were in Nebraska with the Watoto Children’s Choir (#77), which has been touring the United States for more than five months in an effort to bring more awareness to Watoto Child Care Ministries and the needs of women and children in Africa. The Watoto Choir #77 stopped in our hometown of Crete, NE, where they gave a free performance that had everyone clapping and worshiping God. When our church had asked for volunteer host families we were eager to sign up and I’m glad we did. We always look forward to meeting new people and hosting others in our home. What we did not know, was just how much this group — these kids — would touch our hearts and impact our lives in just twelve short hours. The concert was amazing! [Watch and “like” their YouTube video HERE.] At the end of the performance, we were given the opportunity to see photos and hear short stories of children in Uganda who were in need of sponsorship. For just $38 a month (less than I’d spent on a new pair of shoes I’d ordered online a few days before) we were able to sponsor a child and help provide food, clothing, healthcare, and a quality education. We chose to sponsor a young girl named Gift. She lives with her single mother, who struggles to provide for the family. Gift has never known her father. Because of poor living conditions, her mother could not afford to send Gift to school. 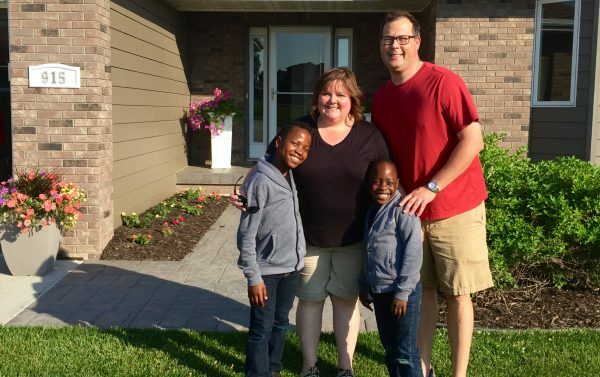 Watoto is lending a helping hand to this family through the Living Hope and Watoto Neighbourhood programs. We have the privilege of sponsoring this young girl named Gift. Someday, Gift would like to be a doctor and we are confident that she will reach her God-given potential. Photo courtesy of Watoto Child Care Ministries. Watoto (which means “children” in Swahili) was founded by Gary and Marilyn Skinner in 1984. 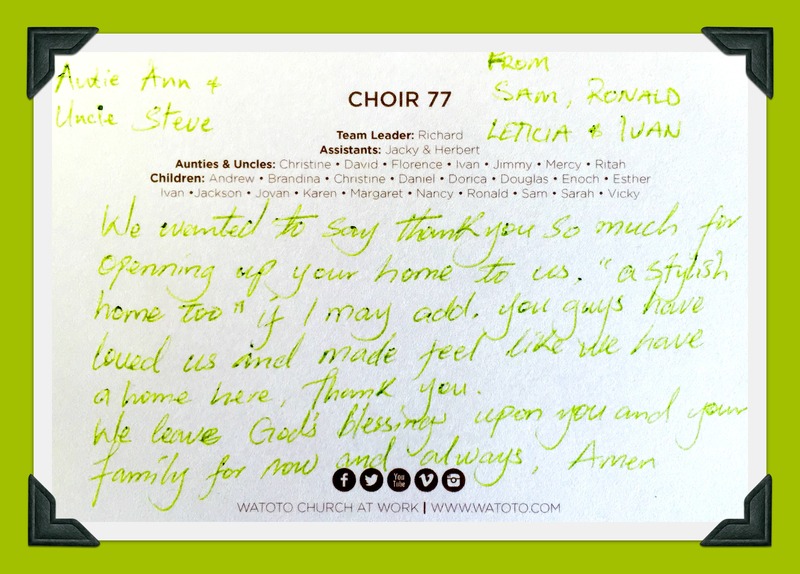 Their story is best told in the excerpt from the Watoto website at the bottom of this post. After the concert, we brought the two kids and their chaperones back to our home in rural Nebraska for the night. 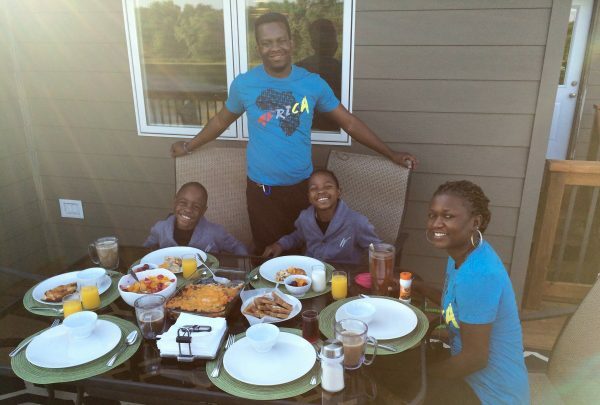 We shared some food and Ivan and LaTicia told us all about Watoto — how they care for widows and orphans in a country that is devastated by poverty and disease. As we sat around our table, we looked at Google images of their houses, built with the help of volunteers in circular “clusters” which formed a village. We learned that orphaned children live in the homes with a house mother and siblings which allows them to grow up in a loving, family environment. 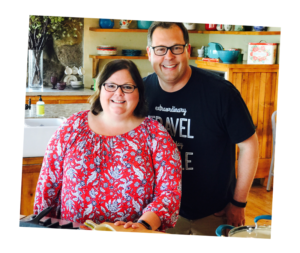 We were so intrigued by this ministry and everything it is doing for those in Africa that we stayed up way too late talking with our guests. After a short night’s sleep, we reconnected in the morning over the breakfast table. 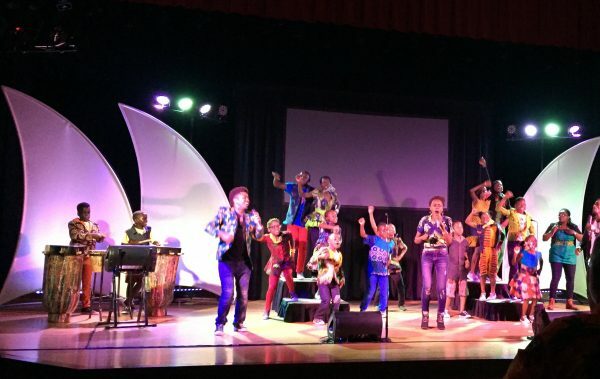 We learned more about the Watoto Children’s Choir and all of the preparations and planning that go into taking a group like this across the globe and into new communities. From left: Sam, Ivan, Ronald and LaTicia joined us for breakfast outside. When it was time to return them to Crete Berean Church for a long-day’s drive to their next stop in Colorado, we were genuinely sad to see them go. We prayed together and said our goodbyes and felt so richly blessed to have had this opportunity to meet. Sam and Ronald just before they loaded the bus to travel to their next concert location. After I’d drop them off, I returned home and went downstairs to gather the bed sheets and towels for washing. On the bed, with sheets neatly folded and stacked, was fittingly, a postcard from our guests. A “thank you” from Choir 77 and a lasting memory of our time together. We will cherish it, and you, forever. 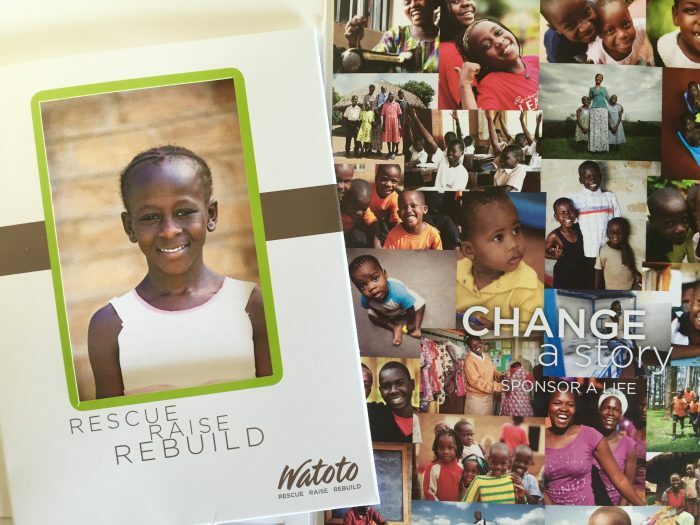 If you would like to know more about what you can do to support Watoto Child Care Ministries, please visit their website at www.watoto.com. Founded by Gary and Marilyn Skinner, Watoto was birthed through Watoto Church; a thriving, community-focused church the couple planted in Kampala, Uganda, in 1984. Back in 1988, in a town called Rakai, Gary Skinner was confronted by a stark reality that he could not ignore. Eight years earlier, he and his young family had moved to Uganda; a country that was known for its violence and poverty. They planted a church in Kampala, which they believed God would use to restore hope to the city and nation. Uganda’s people had endured so much. Corrupt and oppressive rulers had waged ruthless wars against the people and, when they were done with their slaughter, nearly a million were dead. Gary was taken to visit a 79-year-old widow who had mothered seven children. As they walked through the banana groves behind her small hut, she pointed out the graves of her husband and six of her children. AIDS had killed them all. Her one surviving child, a daughter, was dying of the same disease. Visiting this woman stirred Gary to the core of his being and became one of the defining moments of his life. In 1994, Watoto Child Care Ministries was birthed out of Watoto Church as a result of this encounter. It started with one simple house in Kansanga; a suburb that is eight kilometres south of Kampala. Here, eight orphans and a widow were given the chance to become a new family. This was just sooo beautiful and really inspiring! Awesome, thanks so much for sharing! Our pleasure. We really enjoyed getting to see and know this group.